Only 3 students at a time, so there’s plenty of time to help everyone. Courses are arranged to suit, so please enquire to book a course with me! Come and use my facilities in my studio at home and learn to make a 6 x 4″/10 x 15cm linocut print. All linocutting tools, ink, papers and other materials will be provided: just bring along any photos/drawings/other pictures for inspiration. Preparing any images so they are already 6 x 4”/10 x 15cm is a good idea. 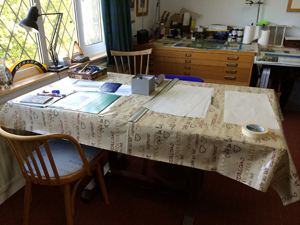 If you have any lino tools please bring them along too, and any other interesting pictures for reference will be good for everyone to look at and share. Tea, coffee and other drinks will be provided, but please bring along a packed lunch. The day will start at 10am and finish at 4pm. Price for the day £50.00, payable in advance please. Please note my studio is upstairs, and this is a family home where there are 3 cats. Please be aware of this if you have mobility problems or are allergic to cats.